I always enjoy designing vehicles but I don't get to do it often. Which is probably just as well since I'm not a technical artist. How do you design a dinghy with paddles? 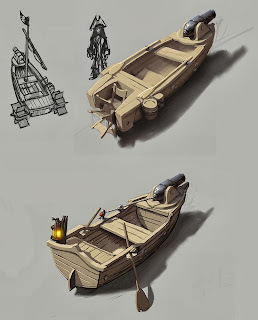 That's what the team asked for, since they didn't want to add a rowing mechanic to an already huge game. 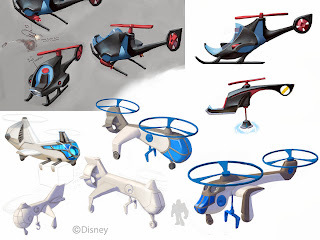 I think after seeing the top concepts they realized that the idea didn't work, and asked for the bottom concept, which was a tag-team between me and Ben Simonsen. 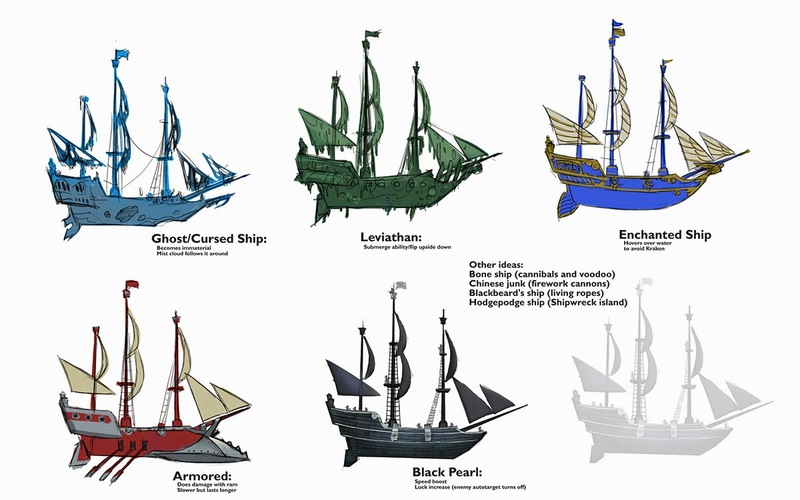 Very early in the Pirates playset, we brainstormed things that would be cool to do in hopes of inspiring the design team. 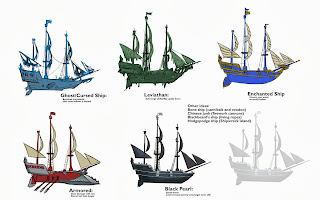 One of those ideas was making the ship customization change the behavior and gameplay of the ship. The idea didn't gain any traction, though. 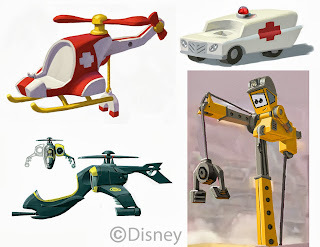 I don't think the magnet helicopter made it into the game. The top right ambulance was from a sketch by the amazing Scott Gwynn. As you can see, I did do a lot of helicopters. 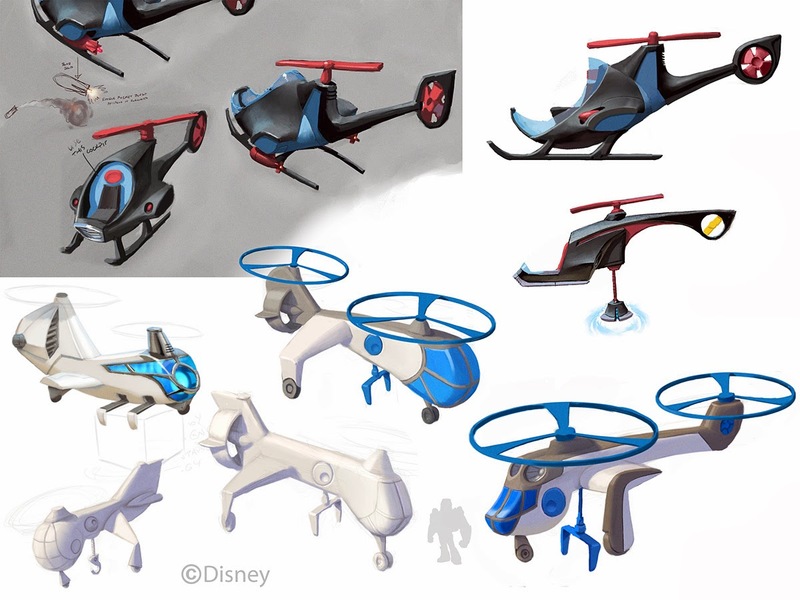 The top and bottom right helicopters are the ones that were approved to go in the game. Great post Sam. It's fun to see all this stuff again makes me feel a little nostalgic. It was great being an intern and working with you guys. Thanks for the shout out! Scott: Yeah, we miss you guys here now. Maybe some day you'll come back? How about this for a design for a wall painting, in the tried-and-true Art Nouveau style? : http://wahooart.com/Art.nsf/All-Popular-Artists, by the famous English artist, Audrey Beardsley himself. You can also order a canvas print of the picture from wahooart.com.